PRODUCT DESCRIPTION: Permethrin based product which is mixed with water and then either sponged or sprayed on targeted pets. 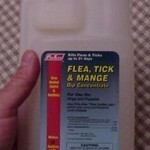 It is odorless, will provide a quick kill of both adult and larva stages of the flea and will last 1-2 weeks. 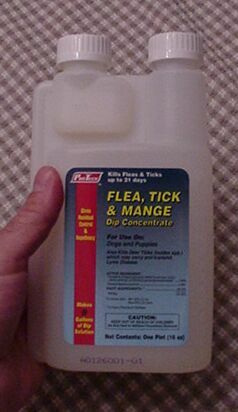 TARGET PESTS: Fleas, Ticks, Mange and other pests like lice. WHERE TO USE IT: Primarily dogs though permethrin has been used on just about any animal in the past. Cats will certainly be sensitive to it and for them we recommend the Water Based Pet Spray or the Flea Stop. RATE OF APPLICATION: 4 ounces per gallon of water. RELATED PRODUCTS FOR THE PET: FLEA COMB OXY MED ITCH RELIEF SPRAY MELALEUCA SHAMPOO WATER BASED (GENTLE) PERMETHRIN PET SPRAY PETCOR (alcohol based – strongest pet spray available – KILLS FLEA EGGS!!) TRIPLE PYRETHRIN PET SHAMPOO (great smelling and very effective) FLEA POWDER (for treating dogs and cats).